With the expansion and increased availability of action cameras, we’ve seen tons of different videos. Many of them are really epic, fun or so stupid that they cause some kind of a reaction. Because of this, our criteria rise and it’s not that easy to get impressed and amused anymore. But then, something like this comes up. Dušan Vižnik was filming a bicycle ride through the woods in Slovakia when suddenly, a bear showed up running towards the cyclist in front of him. It’s scary as hell, and definitely an action cam video that will grab your attention. 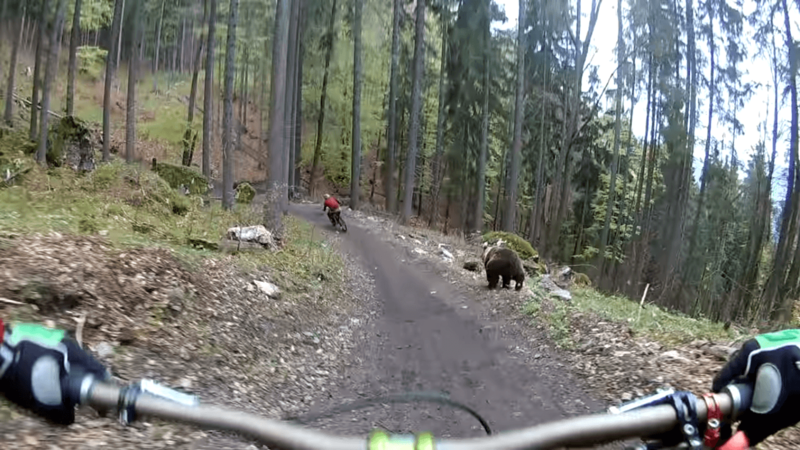 Dušan and his friend were cycling in the bike park Malino Brdo in Slovakia when a bear showed up out of nowhere. In the video, it seems as it’s running straight at the cyclist in front and it’s chasing him for a while. I can only imagine the fear he felt when he saw it. Fortunately, it seems that the bear probably wasn’t in search of lunch: it went back to the woods after a short while, so everything ended well. I recently had a chat with my cousin about action cameras and mentioned that he could buy one. He said he didn’t want it because the only “sport” he does is fishing. But apparently, action cams sometimes capture insane stuff like this even in the sports that are not too amusing to watch. Frankly, I find cycling equally “fun” as fishing if just watch the videos of it and don’t actually ride. But this “Slavic cycling” video definitely grabbed my attention. And as a bonus, it has the most epic YouTube comments I’ve ever seen. So, if you want to get amused after you survive the mini heart-attack, check them out too. Oh wow! It’s brave he kept following his friend and the bear! Inspiration to step up your game. Pedal faster.